The pace of change in today’s dynamic global economy is a difficult one for many organizations to keep up with. Equipping a multinational company with the agility needed to remain competitive requires optimized internal processes that support business goals, and business leaders are taking a closer look at what that means for core functions like international payroll and human resources. Determining whether an evolving workforce is driving global opportunity or if it’s the other way around is a chicken and egg scenario. Both forces are reshaping our working world, and international employers must be ready to respond. Key to that readiness is the adoption of business systems that offer the flexibility and scalability companies need to adapt to challenges and opportunities as they come. Whether it’s an ERP, HCM, or DMS, any information management system worth the investment will focus on two central needs: data integrity and process optimization. However, this simple truth is complicated by the fact that those terms mean different things to different providers, and nowhere is this more true than in international payroll. Identifying a payroll solution that meets a company’s needs, supports its goals, and provides the requisite agility is not straightforward, in part because key terms used to describe important features are often reduced to buzzwords or left unexplained. 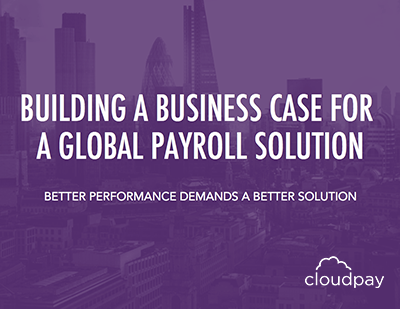 Here, we aim to remedy that, by defining the terms every multinational should look for in a multi-country payroll solution. When it comes to developing and maintaining advantages in business today, data is the key. Big data market revenues are projected to increase from $42 billion last year to $103 billion in 2027, achieving an astonishing compound annual growth rate of 10.48%. A recent Accenture study reported that 79% of enterprise executives agree that companies that do not embrace big data will lose their competitive position and possibly face extinction. All to say that investing in the collection and protection of your company’s data is integral to success. And centralization is the first step. Centralized data is that which is collected, stored, processed, and maintained all on a single platform. By centralizing data and its processing, companies secure greater control over that data, which translates into greater compliance, improved data security, and more direct cost management. For international payroll in particular, centralized data enables more secure processing, faster timelines, and dramatically improved accuracy. Whereas the traditional aggregator method lets international payroll customers see their data on one dashboard, when in actuality it is managed across multiple local systems, a centralized payroll platform holds and processes all your payroll data in one place. The idea of robotics and automation in the workplace has been a hotly debated topic for years. However, it’s important for business leaders to understand the reality of applying automation to improve data-dependent functions like international payroll. While the spectrum of automation possibilities includes everything from simple chat bots to revolutionary AI, robotic process automation (RPA) is the version relevant to payroll and HR. RPA has the ability to execute programmable, repetitive, high-volume, digital tasks with greater speed and accuracy than people. Applied to multi-country payroll, it means eliminating time-consuming manual tasks like data validation and minimizing the chance of human error as payroll data is moved between systems. In the case of verifying data, for example, due to time constraints, a payroll specialist typically spot-checks spreadsheets for errors and has to trust the remainder is correct. In contrast, a robotic validation tool can check 100% of the data almost instantaneously and even categorize and prioritize detected errors according to your organization’s unique specifications. While the payroll team may not be as visible as human resources or high-profile as finance, it is equally important and very closely connected to both. Integrating your international payroll solution with the systems used by these related teams unlocks important benefits across each function, as well as for the wider organization. Many of us use integrated systems in our daily lives, accessing the data that matters to us online, on our phones, or by asking Alexa. When you integrate systems for multi-country payroll and human resources, the data and workflows used within each system are shared directly between systems via an interface, not entirely unlike the API that lets you listen to or share a playlist on Spotify. When business systems are integrated, automated workflows trigger key events, such as the input of employee data from the HCM to the payroll system or publishing final payslips back to the HCM for employees to access. For multinational companies in particular, integration can save a tremendous amount of time for both the payroll and HR teams. More importantly, integration minimizes the need for manual movement or manipulation of data, which means greater security, compliance, and accuracy. If everything discussed so far is about strengthening the quality and integrity of payroll data and processes, analytics is about tapping into their power. The word ‘analytics’ is used indiscriminately across service providers to refer to a broad range of capabilities, but understanding the real meaning and the value of analytics is an important step for international payroll leads. SLAs, exception reports, and outcome figures deliver final numbers based on the result of each payroll run. The most basic form of analysis interprets these numbers to quantify results and overall changes, like total error counts or a percentage showing how timely the payroll was. These are important numbers to have, of course, but they don’t help you understand the process. Where in the process did the errors occur? What kind of errors are they? What is the likelihood of the same issues recurring next cycle? What can we do to resolve them going forward? Those are the kinds of questions that real-time, process-based analytics can answer. 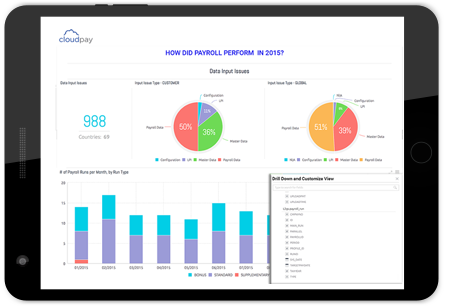 Instead of a number of total errors, you see that 60% of issues were detected at the data input stage, which empowers you to look closer at that event, and upstream of it, to explore ways of improving data accuracy before it gets into the payroll system. That’s the difference between information (results) and insight (options). And that’s what international payroll teams need to improve processes, provide greater control and savings to the organization, and deliver better service for employees. An important fact about payroll that many outside of the function don’t realize, is that the payroll result is not the end of the pay cycle. The data prepared by multi-country payroll teams must be sent to a treasury services team or provider, who will actually execute the payment of salaries to employees and taxes to administrative bodies. All the components of advanced systems listed above also apply to the payments process. A fully optimized international payroll solution includes treasury services to effectively handle the complete, end-to-end pay process. Centralized payroll data will be automatically entered into the integrated payments system, all of which can be monitored and measured by the same analytics tools. 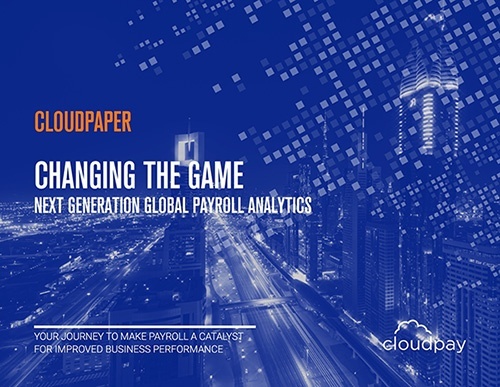 Suddenly global payroll teams have end-to-end visibility of and control over the entire pay cycle, and can see what works well, where improvements are needed, and even replicate successful workflows to optimize others. Regardless of their size, industry, or global footprint, multinational companies have a variety of providers to choose from for their international payroll needs. The difficulty lies in deciphering the specific capabilities of each one and understanding how they meet your needs. Looking for these five factors can help ensure the solution you choose is not only able to meet current needs but is positioned to evolve with your company well into the future.